Sonnenberg Station has had the privilege of singing in some of the most beautiful churches and venues in central Ohio. 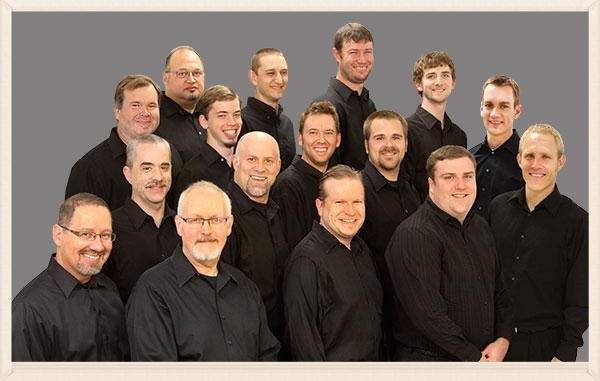 Since 2006, the group has delivered high-quality choral music to thousands of appreciative listeners. For performances since Spring 2013, check here. We will be joined by a women's ensemble under the direction of Kay Shue for this last performance. December 1 - 11:00am at Dalton High School, 177 N. Mill St; Dalton. This was part of Dalton's Holiday Festival. December 16 - 7:00pm at Kidron Mennonite Church 3987 Kidron Road; Kidron. Central Christian’s boys ensemble sang at halftime and joined us for "Coventry Carol". Saturday, February 12, 7pm - Froliche Dorf: Old Timey Radio Variety Show at Central Christian School Performing Arts Center, 3970 Kidron Road, Kidron, we'll do a half dozen pieces. October 23 - Akron - as a featured guest choir with the Summit Choral Society's Great Hymns of Faith concert. In Akron at St. Bernard's Catholic Church, 44 University Avenue. See www.summitchoralsociety.org for details. - nearly 600 attended, an overflowing house! Offering was given to Bridge of Hope Girl's School in Liberia. 14367 Hackett Rd, Kidron, OH - nearly 500 attended, a packed house! Offering was given to MCC. June 25, 2006 - Berlin Mennonite Church, Berlin, Ohio - 7pm - a very full sanctuary - nearly 400 attended! Offering was given to MCC.